From preschool teachers to community social workers, child development professionals are skilled at understanding the needs of children. Each child is different, requiring these workers to adapt to a variety of emotional, social and academic situations. An online degree program in child development provides the training needed to foster positive outcomes in the lives of children. Learn more about online child development degree programs, coursework, career outlook and licensing requirements. Best Online Child Development Programs 2018-2019. Earning an online degree in child development can put students on the right path to become a successful worker in the child development field. Students will develop a comprehensive understanding of the emotional, mental, and social development of children, all without compromising the student’s already busy schedule. We’ve done some research and found the best programs offered throughout the country, basing our findings off of student/teacher ratio, acceptance rate, and overall cost. 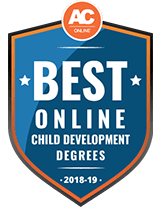 Students interested in completing an online child development program can look below to find the best programs offered in 2018. Appalachian State University's Bachelor of Science in child development - birth through kindergarten program is a part-time (6 to 8 hours per semester), year-round program. It's primarily online, combining both synchronous and asynchronous coursework, though Appalachian State cautions students that not all courses listed may be delivered to distance education students. The 7 semesters of coursework lead students to one final semester of student teaching. The degree is designed to prepare students for careers as teachers for children from infancy to kindergarten, such as those in preschool education and preschool special education. Concordia University - St. Paul (CSP) is a private, liberal arts university that is part of the Lutheran Church - Missouri Synod-affiliated Concordia University System. CSP offers an online-only Bachelor of Arts in child development degree-completion program designed with busy adult students in mind. The program requires completion of general education coursework (through Concordia and/or other accredited institutions) and 42 credit hours in the major (offered fully online) for a total of 120 credits. Students must also complete fieldwork in licensed early childhood learning or child care centers. Graduates typically pursue careers in a variety of social work and education-related occupations in both public and private settings. Union Institute & University is a private, nonprofit research university with its main campus in Cincinnati, Ohio, and satellite campuses in California, Florida, and Vermont. UI&U's Bachelor of Science in child and adolescent development is offered in a hybrid format that combines online coursework with in-person classes at the school's Los Angeles and Sacramento, California, campuses. UI&U features a generous credit transfer policy that allows students to apply up to 90 credit hours from an accredited school to the total 120 hours required for this degree. The child and adolescent development program prepares students to work in a variety of occupations in the health, human services and education fields. UI&U also offers a Bachelor of Science in early child studies that can be earned entirely online. The bureau of labor statistics provides the following data about job growth in the Child Development industry. As well as the following national median salary data for several different careers in the field of Child Development. No single career path exists within child development. Instead, graduates of online child development programs can pursue—or even create—the occupational avenue that best suits their personal and professional goals. Below is an example of how one individual embarked on a career in child development. Given the hands-on nature of child development work, it’s natural for students to have concerns about attending an online child development degree program. Fortunately, most programs are designed to provide the same level of education and experience as a campus-based option, and online students will receive a comprehensive educational experience. Below are some features of online programs in child development. Self-Paced Learning Although curriculum mirrors campus-based programs, online degrees in child development come with a bonus: the flexibility to set a self-paced schedule. Most programs can be completed almost entirely online, supplemented with a local clinical experience. Local Clinical Experience Students gain practical experience by working in local childcare facilities or other centers. Some programs have placement coordinators, while others require students to secure an approved site for their field experience. Extensive Use of Technology Learning Management Systems, such as Blackboard or Moodle, allow students to access their course materials, take examinations, and communicate with instructors and peers. Some programs may offer mobile apps and other forms of online instructional support. Software and hardware requirements vary by program, but typically include the latest version of a web browser, a webcam and microphone, and Microsoft Office suite. Child development is a dynamic area of academic study, with online degrees available at both the undergraduate and graduate levels. Curriculum is designed to provide students with a foundational understanding of the concepts of child development, preparing them for either graduate study in related fields (e.g. psychology, education), or direct entry into a career. Child development can also serve as a secondary major for students pursuing coursework in areas such as early childhood education or special education. The Bachelor of Arts in child development usually takes four to five years of full-time study, with most programs requiring between 120 and 128 credit hours. Graduates should be prepared to enter a range of careers in early childhood settings, or to continue into graduate and professional programs of study. Coursework covers the theoretical foundations of early childhood cognitive development, educational and social psychology, and evidence-based teaching techniques. Classroom instruction is typically enhanced by a supervised practicum or clinical experience conducted at a local preschool or early childhood development setting. A Master of Arts in child development can serve as a launching pad to leadership positions in a range of disciplines, or may position graduates for continued studies at the doctoral level. Curriculum concentrates on the theoretical underpinnings of child development, as well as research into issues in the field. Drawing upon multiple academic areas—from anthropology to psychology—master’s programs examine how emotional, social, cultural, family and hereditary factors influence the development of children. Master’s programs typically require between 30 and 36 credit hours, and culminate with a thesis or project. The number of fully online doctoral programs in child development is limited; however, several hybrid programs are available that allow students to take classes online and supplement coursework with field research. These terminal degree programs focus on applied research, and graduate students can expect to conduct advanced studies into the biological, behavioral and psychological factors of learning and development, gaining insights that inform educational practices. Curriculum not only addresses the philosophical and cultural foundations of development, but also examines current scholarship and research in the field. A doctoral program traditionally requires 60 to 72 credit hours of study; students must also research, write and defend an original dissertation. Graduate certificate programs typically range from 12 to 21 credit hours, and allow students to focus on specialized areas of child development, such as students with disabilities, mental health, or emotional/behavioral concerns. These programs are geared toward working professionals and can be completed either as a stand-alone certificate, or as a complement to a graduate degree in child development. Curriculum varies by program but typically covers topics such as assessment, clinical practice, and child development theory. Child development degree programs connect theory, research and practical field experiences, preparing graduates for a range of professional opportunities. Curriculum focuses on three major concepts: foundations of child development, learning environments, and the understanding of developmental contexts such as social, cultural and family issues. Although specific coursework varies by program, the table below outlines common classes offered in online child development degree programs. Introduces students to the learning processes of young children, covering subjects such as creating interactive learning environments and evaluating instructional activities. Focuses on foundational principles and research into the social, emotional, behavioral, cognitive, and language development of young children. Students examine the impact of educational settings upon each domain. Students examine how to create effective and supportive learning environments for toddlers and young children. Topics include building child relationships, the roles of families and child care teachers, and communication skills. Discusses the theoretical frameworks of toddler development, teaching educators strategies for teaching toddlers, techniques for crafting appropriate curriculum, and ways to create adaptive learning environments and assess toddler development. Examines major issues involving the safety, health and nutrition of toddlers and young children, including a review of pediatric medications, working with sick children, proper record keeping, disease control, and classroom sanitation and maintenance. Because of the sheer breadth of professional opportunities within the child development field, prospective students have a wide selection of potential educational programs. Some may concentrate on a general curriculum, while others will focus more specifically on preparing graduates for careers in teaching. Students considering online child development degrees may want to consider the following before choosing a program. Is the program accredited?Licensure typically mandates that students graduate from an accredited program; employers often set this requirement as well. Students should check if the program holds accreditation from either the Council for the Accreditation of Educator Preparation (CAEP) or the National Association for the Education of Young Children (NAEYC). Does the curriculum follow NAEYC standards?The NAEYC sets the accreditation standards for child development curriculum. Programs that meet this standard demonstrate a commitment to quality and meet industry guidelines. Are academic concentrations available?Depending on the student’s future goals, it may be necessary to specialize within a degree program. Students should check to see if the program offers academic concentrations in areas such as preschool, infant/toddler, or family health. How are clinical practicums handled?Like their campus-based peers, online child development students must also complete in-person practicums. It’s important to know how site placements are handled, and whether the program has agreements with local social service or child development centers/programs. In some cases, students may be responsible for locating and getting approval for a local site placement. Are graduates qualified for teacher certification or graduate degree programs?Students who wish to pursue teaching or careers that require graduate studies (e.g. school counseling) should make sure that credits are recognized by other institutions and can be transferred. Accreditation is a voluntary review process that measures the quality of both educational institutions as a whole, as well as their individual programs, to ensure they meet industry guidelines for instruction. The main accrediting body for education is the Council for the Accreditation of Educator Preparation (CAEP). State agencies typically require graduates to attend a CAEP-accredited program to teach at the K-12 level. For child development and early childhood education programs, the National Association for the Education of Young Children (NAEYC) is the primary accrediting body. The NAEYC accredits programs at both the undergraduate and graduate levels, through its NAEYC Early Childhood Associate Degree Accreditation and the NAEYC Early Childhood Baccalaureate and Graduate Degree Program Accreditation (in partnership with CAEP). In addition to CAEP and NAEYC, other accrediting agencies for early childhood and development programs include the Council on Accreditation and National Early Childhood Program Accreditation. To learn more, visit our page about the overall process of accreditation. Careers in various child development occupations begin with earning a bachelor’s degree in child development. The map below details a sample timeline of preparation steps to take prior to applying for admission to a four-year program of study. While in high school, students can get hands-on experience through internships or employment opportunities with child development programs such as Head Start or day care facilities. Volunteering with service- or youth-oriented programs can familiarize students with concepts and situations they will encounter as a child development student. Students should consider reference sources who know them well and can speak to their knowledge of and commitment to the child development field, as well as their academic abilities. Such extra training is another way to demonstrate a comprehensive commitment to serving others. From working as a day care provider to a preschool director, or a family development specialist to a case manager, prospective students can tailor their education to meet their future career goals. Advanced education in the field can also open the door to upper-level careers in areas such as teaching, special education, counseling or educational leadership. Below is an overview of five child development career possibilities. Working on the front lines of child development, preschool teachers work with children under the age of 5 to familiarize them with organized learning environments and introduce them to the fundamentals of reading, writing and math. Working in a variety of educational settings—from day care centers to private schools—preschool teachers help children develop their motor skills, refine their social skills, and engage in physical play. Although some entry-level positions are possible with a diploma or associate degree, preschool teachers may be required to hold a bachelor’s degree and teaching certification if they work in public school districts or with Head Start. As licensed educators, professional school counselors are typically required to hold a master’s degree. Uniquely positioned to understand the intersection of the personal, social, emotional and academic needs of students, school counselors help guide students to success in K-12 educational settings. Working with school faculty, parents, administrators and community members, counselors help create a safe learning environment by developing and addressing counseling programs that address the needs of all students. Beyond master’s-level preparation, school counselors must also meet their individual state’s certification and licensure requirements. Early childhood instructional coordinators are educators who possess not only classroom-based experience, but also a broad understanding of standards-based curriculum and instruction in early childhood education (birth to grade 3). Instructional coordinators develop curriculum and assessment models that create active classrooms and meet the standards for their individual states. They may also host teacher development workshops, help teachers implement instructional activities, assist with early childhood assessments and screenings, and conduct site visits. A master’s degree, along with teaching certification and professional experience, are typically required for the position. Social services managers serve as liaisons who connect families to community resources. They may assist clients in counseling services, coordinate with families in transition, and maintain records and reports. Social services managers work for a variety of organizations, from nonprofit associations to government agencies; depending on the scope of the organization, they may focus their efforts on an area that targets a certain population (e.g. early childhood education or infants/toddler services). A bachelor’s degree is the typical minimum educational requirement for employment. The primary responsibility of child welfare social workers is to ensure that children’s needs—physical, psychological, emotional and social—are met. Employed at the local, state and federal levels, child welfare social workers may work in organizations such as community health centers, schools or youth facilities. Central to their position is the ability to identify and assess needs, and then match children and their families with the appropriate social services or counseling. They may conduct individual interviews with children and participate in home visits to determine a service plan. Serving as case managers, child welfare social workers monitor progress and change service plans accordingly. Social workers are required to be licensed, which usually requires a graduate degree. Within the field of child development, certification and licensure requirements vary by occupation. For example, in social work licensure is managed at the state level. Requirements are dependent on the jurisdiction, and professional practice and social workers can be licensed for several positions, such as Licensed Social Worker (LSW), Licensed Clinical Social Worker (LCSW), or Certified Case Worker (CSW). On the other hand, teachers must hold state certification and licensure, with common requirements including graduation from an approved teacher program, a bachelor’s degree, and passing scores on licensure examinations. Students should check with their state’s licensing agency for specific requirements to work in day care centers, schools, and other youth programs. There are two central professional certifications in the child development arena: Certified Childcare Professional and Child Development Associate. The requirements for each are different, but either demonstrates knowledge of best practices and an overall commitment to the field. Sponsored by the National Early Childhood Program Accreditation, the Certified Childcare Professional (CCP) is a credential specially designed for teachers who wish to enhance their teaching skills and demonstrate their understanding of early childhood development. Developed by the Council for Professional Recognition, the Child Development Associate (CDA) is a nationally recognized credential that educators typically use to advance their careers in early childhood education and childhood development. Future educators can select programs of study that prepare them to work with different student populations—from infants and toddlers to students with disabilities. Below are three related teaching programs that may appeal to those interested in becoming teachers. Offered at both the undergraduate and graduate levels, teaching degrees in elementary education can prepare educators to teach in K-8 classrooms. Online early childhood education programs provide students with an understanding of the foundational concepts of child education, preparing them to work in pre-K or other early childhood educational settings. Special education teaching programs are designed to foster the skills and knowledge base required by educators to best serve students with special needs in both public and private school systems.